Police Officer Sunny Lov was struck and killed by a stolen car while directing traffic around an accident scene at the North Central Expressway near Meadow Road. The driver of a stolen vehicle drove through a line of road flares and struck Officer Lov, who was thrown 119 feet into the opposite lanes of traffic. He died at the scene. The subject driving the vehicle was found a few hours later, after abandoning the wrecked vehicle. He was charged with murder and subsequently sentenced to 10 years in prison. 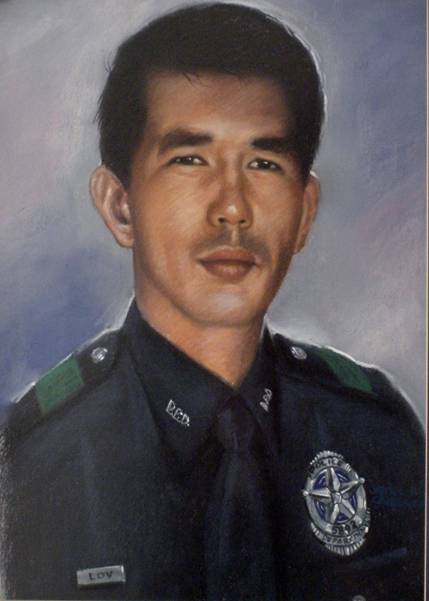 Officer Lov, who was fluent in six languages, escaped the killing fields of Cambodia and came to the United States to start a new life that was cut short just two years into his career with the Dallas Police Department. He is survived by his wife, two daughters, and two sons.